Aanhin mo ang ulam kung walang sawsawan? (SPOT.ph) No doubt about it, Pinoys love savory food. Even if the dish is tasty on its own, we’ll add a sawsawan every chance we get. What’s lechon without sarsa? Piniritong bangus without toyomansi? Fried chicken without ketchup? No disrespect to the chef, but being able to suit a meal to one’s taste satiates the hunger for personalization. You’ll find a variety of choices in any Pinoy household but these nine flavor punchers are the seasonings every Juan cannot live without. Fair warning: You’ll be drooling while reading this list, so keep a tissue on hand. Patis is one of the most important ingredients in Filipino cooking. A dash of this refined flavoring can give any food a savory taste. Usually paired with calamansi, it’s the perfect dipping sauce to enhance fried fish, tinola, and sinigang. Like patis and toyo, suka is another star seasoning in many Filipino dishes. Its sharp taste never disappoints in giving crunchy treats like fried lumpia and chicharon that extra oomph. No fiesta in the Philippines would be complete without lechon. No matter how utterly delicious this roasted pork dish is, it’s not the same without sarsa, a unique sweet and peppery blend that perfectly matches the rich flavors of the meat. The smell of bagoong will make you pinch your nose but the taste is extremely satisfying. This thick brown fish paste goes well with a wide range of food, from mangoes to steamed okra to the peanut buttery kare-kare. What’s more, bagoong can come in sweet, sour, or spiced flavor--perfect for any discerning palate. 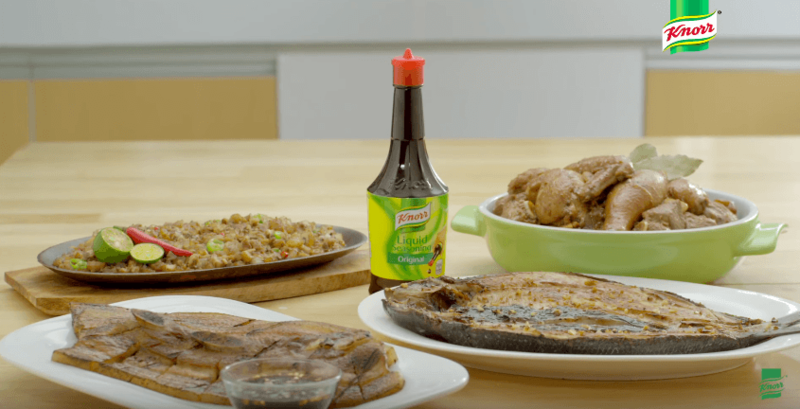 Check out Knorr's website and try the delectable recipes made manamis-namis with Knorr Liquid Seasoning.